At the end of July, Tom, his dad and his brother drove down to Montemboeuf for a week. Luckily they were not too delayed with the ongoing problems in Calais and made it in time for a lovely meal at the Lavender House. Over the next week they had a very busy time of it including a mammoth trip to IKEA, putting together flat pack furniture and getting the house cleaned up. They were also able to get a good look at what had been happening in the house in the month since we had last visited the house. One of the most exciting developments was the installation of the bathrooms. It was so great to finally see something installed that we chose just after Christmas. I am just pleased that we still like our choices! The other big development was the fixing of the shutters. The ‘envelope’ of the wooden cladding can really be seen now. Not only that but it made it much cooler for the builders that were working inside the house. July was a very hot month in Montemboeuf, so I think they were relieved for anything that would cool the house down. The first job for the boy was cleaning the house as much as possible. The builder had done his best, but with all the furniture that would be arriving over the next couple of days they needed the place, not quite gleaming, but as dust free as possible. The boys had a tough time of it, but I think it was probably worth it in the end! The next day they travelled to IKEA to do quite a large shop. Fortunately, IKEA Bordeaux do a click and collect service, so we were able to pre-order and pay for a few items. It may have just been a few, but every little helps when it comes to IKEA. Tom was very lucky that he had the help because they had 3 trolleys worth of goods. I don’t think much can be said about an IKEA shop, other than the fact it took them a long time and they deserved their pineau once they got back! The next day more furniture was delivered including a bed and sofa. Tom assures me that this is still covered in its protective plastic covering. Nether of us are particularly keen for it to get covered in builder’s dust or paint. In the month between Tom’s visits our kitchen also arrived, so Tom and his family made a start putting this together. 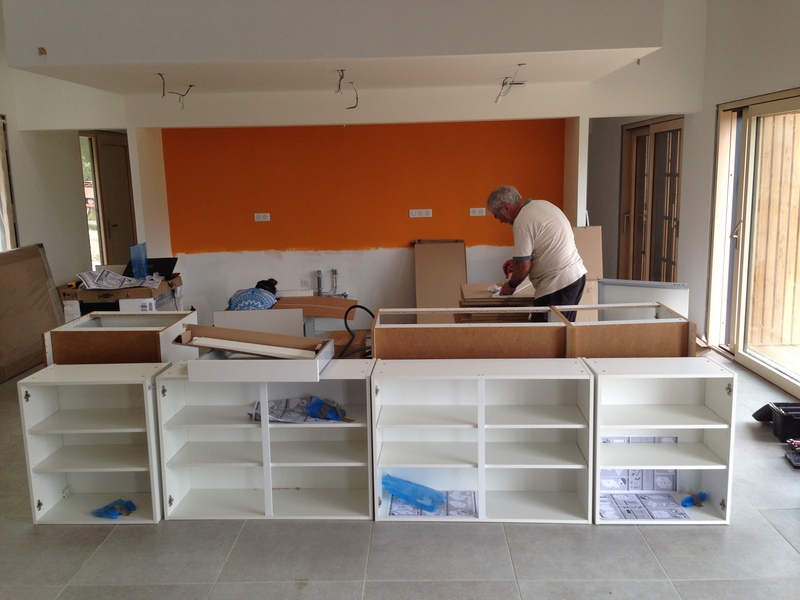 There were quite a few cupboards to assemble and shelves to go in, but they managed to get all this done. All that needs to happen now is for our builder to attach all of this to the wall and install all the electrical goods. We really hope that this can be done by 11th August because this is when my sister and her family will be staying in the house! The Kyle men worked really hard over their week in France and managed to get a huge amount done. Part of me wishes I had been there to see how much progress had been made, but I think Molly and I would have been in the way. Until we get her using a screwdriver it is best that she stays having fun at home! Categories: bathrooms, Interiors, kitchen, montemboeuf weather | Tags: interiors, Montemboeuf | Permalink. The wall is complete, and doesn’t it look great! We are so pleased with how it looks, and I think our mason, Stuart is rather proud of himself as well. All it needs now is a bit of lavender, landscaping and lighting and it will be perfect. When the sun is shining on it, that creamy stone is going to look fantastic. It really has been a labour of love for Stuart and you can see that in the details around the doors and windows. 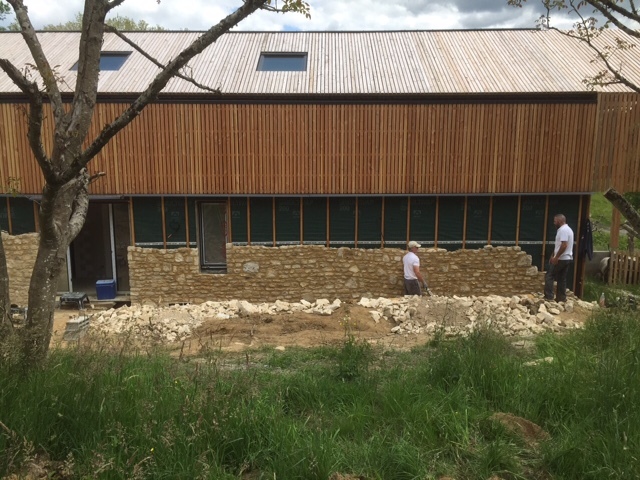 I think that the stone wall really adds something to Tom’s design and while I think that if we had clad the whole building in timber it would have also looked great, this wall adds a whole new dimension. The wall also extends to the pergola, which will make the area in to a really lovely, warm and sunny spot. I can’t wait to get over there an see it. I am also not sure we’ll be able to resist sitting on the pergola with something cold and delicious – even if we are surrounded by building equipment. Categories: House Construction, Landscaping | Tags: Cladding, SLM construction, Wall cladding | Permalink. 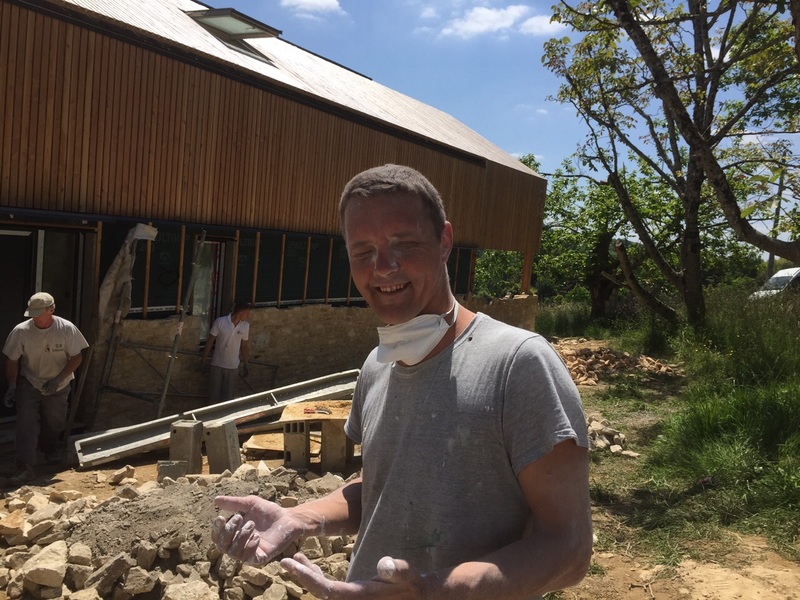 Last weekend, Tom took a trip to Montemboeuf to catch up with our builders who were all kind enough to meet him at the weekend. He managed to sort quite a few problems out, so it was a good job that he went. Unfortunately, these problems have resulted in more costs for us. This is a pain and does mean budgets will have to be reduced elsewhere, but this is all part of the building process. Still, at least now it is all resolved and we do not have to worry about the painting or the kitchen installation. 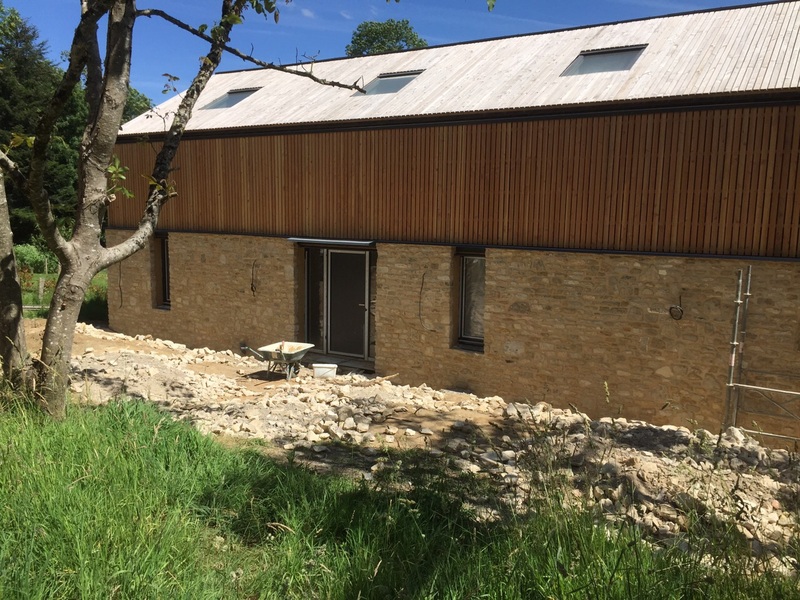 It just goes to show what a difference being on site makes and if we could have been, I think we would both liked to have been there for the whole build. We also have a date for our kitchen delivery, whoop whoop. Luckily, it should be delivered and installed by the time Tom next goes out there in July. SLM Construction also started on our external wall cladding. I was slightly skeptical of this idea especially when I saw how lovely the timber cladding looked. I have always loved the colour of this stone, so I was happy for it to be used, I just wasn’t sure how it would work with the timber. Now that the wall has started, I think it looks amazing and I don’t know why I ever had any reservations. I should by now trust Tom with his design ideas. You would think I would have learnt to after all this time. I must take heed when he tells me his new thoughts for our interiors! In other good news, the sheep are back! The farmer has kindly erected a fence around our new hedge so that they don’t go nibbling on that. From what Tom told me we really need them on site because everything has been growing really well – including the hedge and the newly planted trees. I wonder if Jeff (le fermier) will give us one of his sheep?! 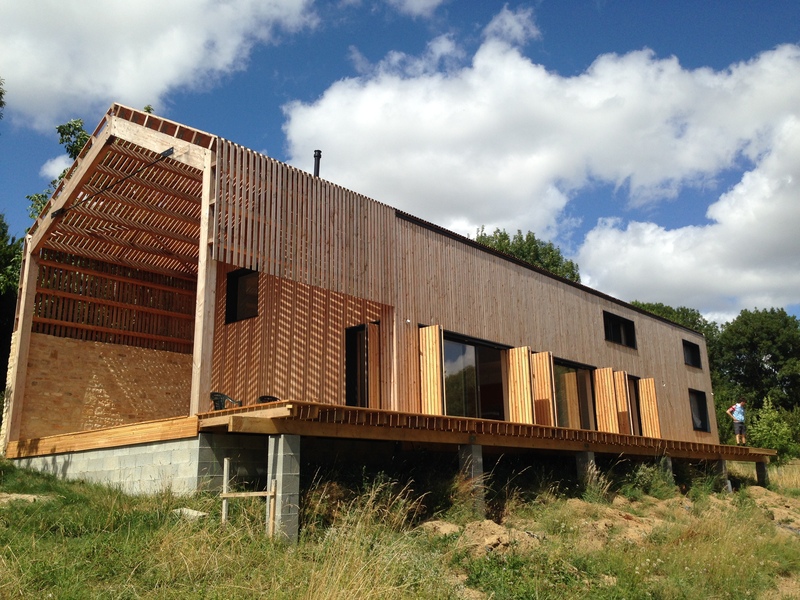 Categories: Construction, Landscaping, Montemboeuf Plot | Tags: Kitchen, Montemboeuf Plot, Montemboeuf weather, Sheep, SLM construction, Wall cladding | Permalink. Apologies for the lack of posting recently, but life sort of took over. Molly started nursery, but was then sick and I was due to go back to work, but then also became ill. I have just about recovered now and I am recuperating in France! Sadly not in Cannes where most people seem to go for that sort of thing, but La Rochefoucauld is very lovely! We are also a little behind schedule, but inevitably these things happen. Unfortunately, not having been on site for six weeks has meant that things have moved more slowly than expected. 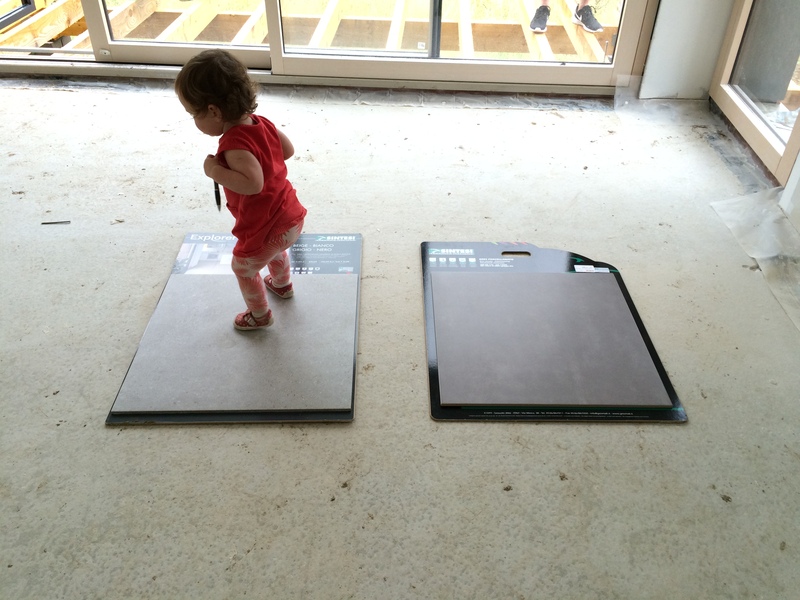 Even though we are behind on the program that the builders had given us, the site had changed considerably in 6 weeks. Externally, the site is looking a lot tidier for a start which makes the approach to the house a lot more welcoming. This is further helped with the very beginnings of the landscaping. We’d contracted ‘An English Nursery in France’ to plant a hedge for us and to do some tree pruning and the work they did has made a big difference to the front of the house. Hedging plants seem to be very expensive in France. We were very keen to use our local pépinière, but it would have been cheaper to buy the plants in the UK and drive them over. This of course, would have not been very good for the plants! 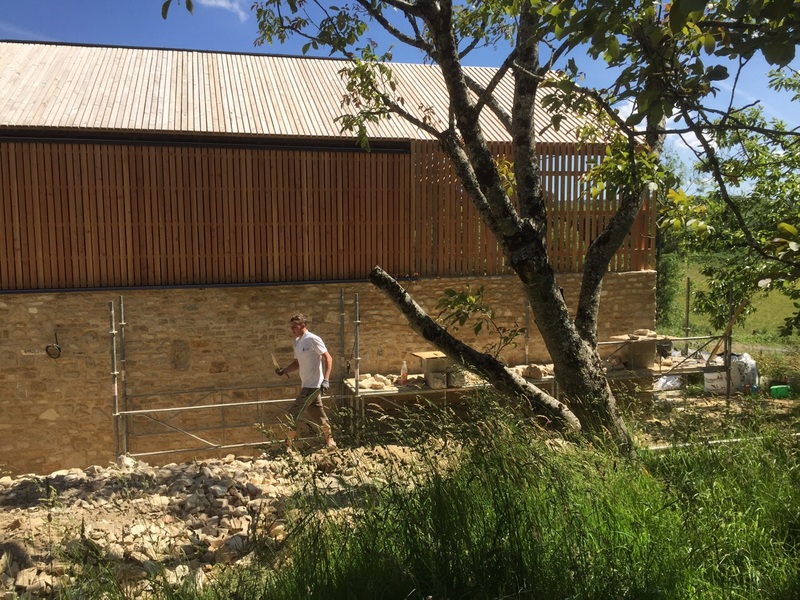 The pergola had also been finished and we were now able to see Tom’s design of a seamless continuation of cladding of the house and pergola in action. I can’t wait to be sitting there with a glass of pineau watching the sun go down. I am sure some of you would like to join me!? However, it is on the inside of the house that the biggest changes have happened. 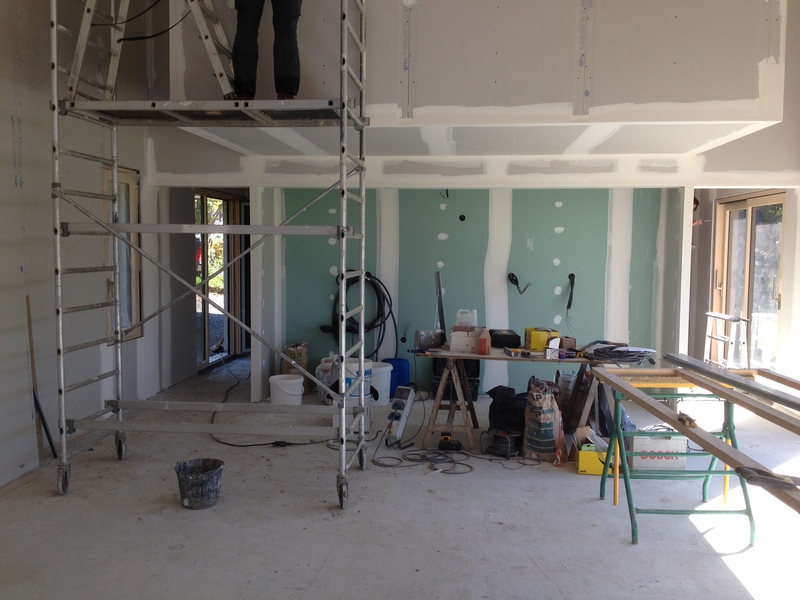 We now have some walls, ceilings, the beginnings of a staircase and lots and lots of wires, pipes and ducts everywhere. 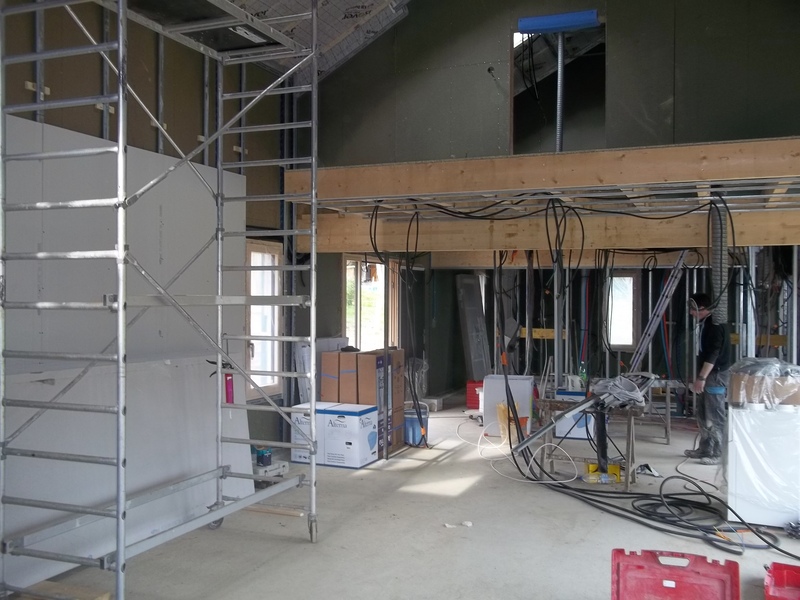 As I have mentioned before, it is difficult to imagine how the layout of the house will look or gauge the sizes of the rooms from the architect’s drawings. When we were last in the house, before the partitions went up, I could not visualise the space and wondered how we would fit two en-suite bedrooms downstairs. Visiting the site again, with the partitions up, I can’t believe how large the areas are. It just goes to show that you really need to see a house with internal walls before you worry about the space! The walls that have been put up enabled us to see that all important framed view that I had wanted Tom to design right from the beginning of the project. It was very exciting to finally see it. Hopefully in the next couple of weeks all the walls will be up! We now have a bit of careful time and project management to work on. It is also vital that the interaction between our mason, plumber, electrician and main builder works as smoothly as possible. We have to time the delivery of our kitchen correctly because there was no way our mason, who is doing the tiling can do a good job on the tiling with big kitchen boxes in the way! It is therefore important therefore that the tiling is finished before we take delivery of the kitchen, but this meant that first fix plumbing and electrics had to be finished before the tiling can start. This organisation of the trades was going to be difficult once back in the UK, so we will have to keep our fingers crossed that until Tom can get back to site things run smoothly with all the trades! Categories: Construction, First fix electrics, First fix plumbing, French builders, Interiors, Marandat, Montemboeuf Plot | Tags: electrics, First fix, interiors, plumbing | Permalink.